Eight overweight pets are being sought to take part in a a slimming initiative by a veterinary charity which says a quarter of UK dogs are now obese. The PDSA says "huge hamsters and rounded rabbits" are among pets invited to enter its 2007 Pet Fit Club contest. The charity analysed the weight of 4,000 dogs across the UK and said the fattest were in north-east England, where 28% of dogs were overweight. Scotland and Northern Ireland both came second with 26% of dogs deemed obese. 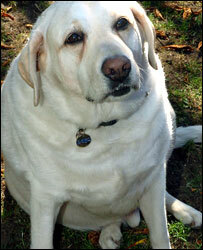 Experts say obese dogs are likely to die two years earlier and may develop conditions such as diabetes and arthritis. The charity's research suggested 19% of dogs were overweight in both the Midlands and Wales while south-east England had the lowest figure with 12%. However, the animal charity said even the lowest dog obesity figure was too high and it wanted to encourage owners to help their pets slim down. The PDSA also said it had found "some startling correlations between people and their pets". Citing recent figures on human obesity by two universities, the charity said people in south-west England were most likely to be overweight and dogs in the same region also scored badly with 24% overweight. In contrast, south-east England's lower pet obesity rate "mirrors human obesity" which was also found to be low in this region, the PDSA said. 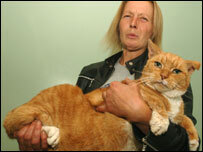 PDSA senior veterinary surgeon, Elaine Pendlebury, said: "It's not just dogs that are piling on the pounds. "PDSA estimates that in the last 20 years there has been a doubling in the numbers of cats that are obese and even our small furry pets such as rabbits and hamsters aren't exempt." The charity has launched its Pet Fit Club competition for the third year running. The eight animals selected will be placed on a 100-day diet and fitness programme and will be regularly monitored by their local PDSA Petaid hospital. At the end of the programme, the pet with the most significant weight loss will be crowned PDSA Pet Fit Club champion. Details of the competition can be found at the charity's website.